Does the Mona Lisa have a twin sister? For years, art historians thought a second version of Leonardo Da Vinci's famous painting was a copy created years after the original. But now that the painting has been restored, it appears it may have been painted at the same time — and in the same room — as its more famous sibling. This junior Mona Lisa, which featured a blacked-out background prior to its restoration lives at the Prado in Madrid. 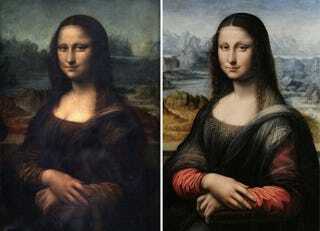 The museum's conservators had long believed the painting was a much younger copy of the Mona Lisa, but after comparing infrared images of the Prado Mona Lisa with similar images of the painting at the Louvre, they realized that the paintings' underdrawings were strikingly similar. This indicates that the Prado Mona Lisa was most likely composed at the same time as Da Vinci's, probably by a student carefully studying his master's great work in progress. So what is the significance of this twin Mona Lisa? Well, Da Vinci's original has been obscured over the centuries, and some of its details are difficult to make out. The restored copy has already offered historians insights into the original composition, giving us a better sense of how the original painting might have looked when it was fresh off the easel. The Prado will be placing its Mona Lisa copy on display in mid-february.